Don't forget to enclose your name and address! Closing date: 30th July. Republic of Ireland addresses only. Goodfella’s Pizza launches a trio of tasty, thin treats. Pizza fans ready their ovens for a slice of extra thin from Goodfella’s. Goodfella’s Pizza, Ireland’s No.1 pizza makers has done it again and launched another new delicious product, the brand new ‘Extra Thin’ pizza range. The new 10” pizza, with a feather light 4mm base, is infused with olive oil offering a lighter, crispy; eat with only 10-12 minutes cooking time, perfect for those special ‘me time’ moments. The Extra Thin range comes in three mouth-watering variants of Vegetable & Goats Cheese, Mozzarella & Pesto and spicy Chorizo & Pepperoni. The Goodfellas Team says, “Our Extra Thin pizza range is a delicious, premium addition that we are delighted to share with the Irish market. With three delicious topping combinations, it’s the quick and easy dinner treat to bring a little bit of Italy to your kitchen table. Goodfella’s Pizza company has been rolling out dough in Ireland for over twenty years, bringing a slice of authentic Italian life to homes across the country with seven delicious ranges catering for all tastes. A superb visit on Cork's doorstep! This medium red coloured wine is nice and bright considering it is 2006. On the nose, it is classic red fruits, cherry and raspberry. In the mouth, it is juicy and beautifully fruity and very well balanced (the balance, a prime aim of the makers Leheny and Gibson). The flavours have been enhanced by 15 months in new and old French oak and it finishes long and well. Very highly recommended. This is quite a light red, again with the classic nose. On the palate, the feel is light and the wine is fruity for sure with a smooth dry finish. It is made for "early enjoyment". A comparative juvenile that lacks the adult heft and sophistication of the Bilancia. Nonetheless a lovely wine and a very pleasant companion, they suggest, “for hearty pastas, duck and lamb”. Highly recommended. Cork’s immensely popular Cornstore Restaurant, on Cornmarket Street, is flying high this year, powered by four “engines”: Aged Steaks, innovative Seafood dishes and a whole squadron of cocktails (led by the special infused mixes). The fourth engine is the service team, smiling, chatty, friendly and efficient. Got a great chance to try it out when I won one of their recent photo competitions and the prize was a full dinner and cocktails. Got a terrific welcome from Sarah and her front of house team. First, to the cocktails. My opener was the Cornstore Whiskey Old Fashioned: Plum infused whiskey, angostura bitters, orange peel, and plum jam. 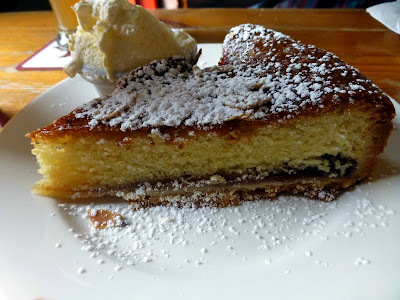 Loved it but wasn't quite ready for the concentrated shot of whiskey when I ate the plum at the end! Later on, I absolutely enjoyed the Cornstore Rum Old Fashioned: Apricot infused Rum, vintage port, angostura bitters, orange peel and apricot jam. The Port and Rum worked a treat in combo and, taking my time on this occasion, that apricot at the end proved very enjoyable indeed. CL’s opening cocktail was one of their “Luxury Cocktails”, a Taiwantini: Hendricks gin, lychee liqueur, cucumber syrup, fresh lime juice, topped with Prosecco. A very cool cocktail indeed, refreshing and, like most of them, easy-drinking! 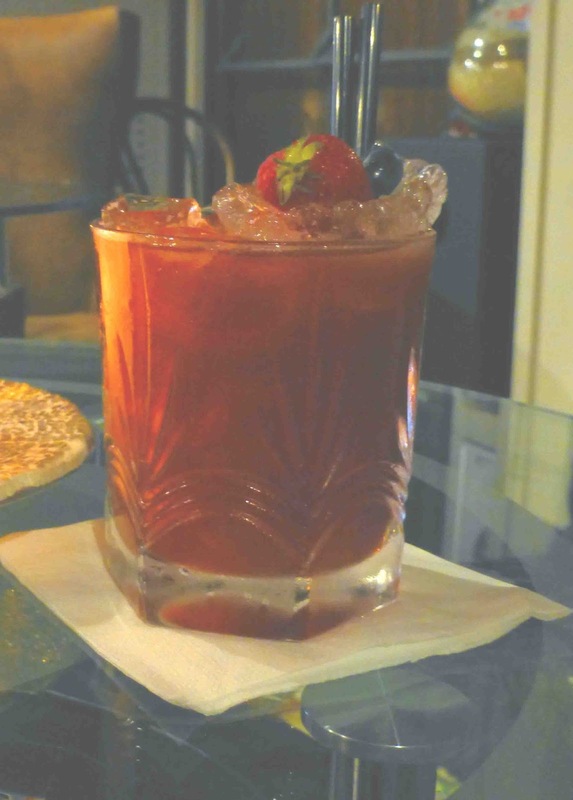 On manager Mike Ryan's recommendation, she stayed on the luxury loop for her second one, the Balsamicotini: Grey Goose, fresh strawberries, balsamico, fresh basil, fresh lime juice, cranberry juice and strawberry syrup. Another superb combination, so well mixed by Stephen at the bar as we watched in wonder! 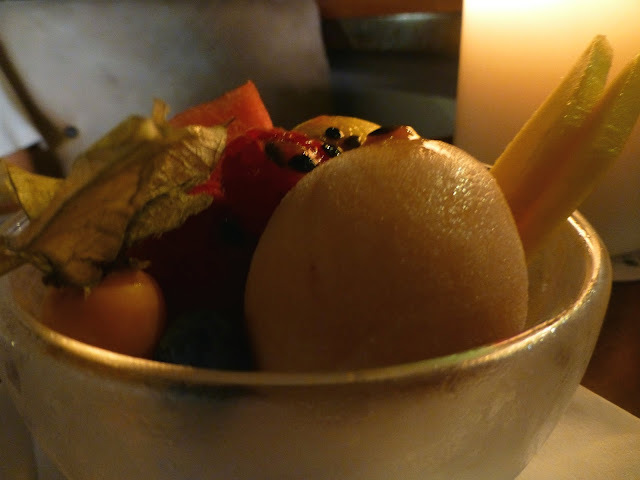 The food was absolutely outstanding and it seems to me that the dishes produced by the Cornstore chefs are just getting better and better. Take mussels for instance. They have three takes here and the top one is the Full Irish: a very successful pairing indeed of the mussels and black pudding. Could hardly believe how tasty this proved, helped by the addition of craft cider and chive cream. Jack McCarthy’s black pudding is also used with the Pan Seared Wexford Scallops but CL went for the delicately delicious Scallop ceviche with baby potato, caper and shaved fennel salad. Jack’s black pudding is one of the many ways in which local produce is used by the Cornstore. Indeed, they buy local as much as they can and the scallops for instance come from the Amber Mist trawler in Wexford’s Kilmore Quay while the mussels that I so enjoyed are supplied by Kinsale’s Jamie Dwyer. Oh and by the way, it isn’t all cocktails here as you can also choose from a range of local beers by Eight Degrees and Dungarvan Brewing and Stonewell craft cider is also available. Back then to the main courses. CL spotted a fish dish on the specials: Pan fried John Dory with Queen scallops, sautéed potatoes, organic leaves and a saffron and garlic aioli. The fish was flawlessly cooked on the bone and was totally delicious. Earlier in the summer, the Cornstore announced that they were aging their own beef and using Himalayan salt in the process (28-35 days is the period). Still plenty of beef left and I picked the simply grilled Fillet, served with mushrooms, onion fricassee, vine roast cherry tomatoes and a foie gras and truffle butter. It is “the best tasting steak we can produce for our customers”. I think it is the best tasting steak I’ve ever had. Now, I’m told that their Tomahawk cut (for sharing) may be even better. Next time! 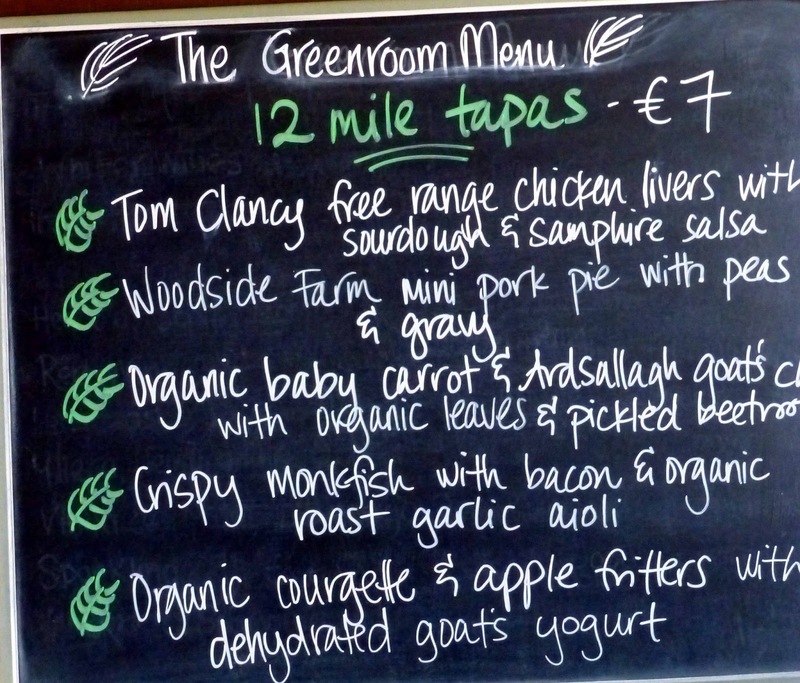 Called down to Midleton last Tuesday evening to sample the food at the Greenroom, the new all day late night cafe under the ample wing of the adjacent Sage Restaurant. 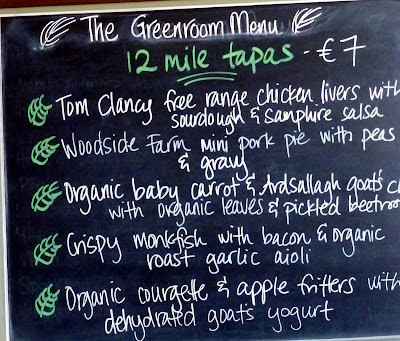 Spotted the 12 Mile Tapas board and immediately saw familiar producers of quality including Woodside Farm, Ardsallagh and Tom Clancy. Five tapas on the board, so we ordered all five. Next question was what to drink. Easily answered by looking at the next board. Lots of local beers here and also Stonewell cider. Could hardly drink all the beers so settled for the Barefoot Bohemian Pilsner from Eight Degrees and two new Cork beers, both pale ales, the Mountain Man Green Bullet and the Kinsale Pale Ale, each dangerously drinkable! The tapas are top class, all the dishes perfectly executed and, at seven euro each, very good value. Take the humble Organic courgette and apple fritters with dehydrated goat yoghurt. Didn’t sound the most promising of the five but the tangy yoghurt made the fritters sing. The Organic baby carrot and Ardsallagh goat cheese with organic leaves and pickled beetroot was another successful combination of taste, colour, flavour and texture. While the cooking here is creative, the food is allowed to speak for itself and this was perhaps best illustrated by the Woodside mini Pork Pie with peas and gravy. The pork flavour and texture were incredible. The monkfish, coated in the most delicate batter and served with crispy bacon and organic roast garlic aioli, was lyrically light, crunchy and gorgeous and probably CL’s favourite. For me, the outstanding bite was the first one into those Thomas Clancy free range chicken livers with sourdough and salsa. Honest food so well handled all the way to the table. The dessert, Red Velvet Cappuccino cake with Bailey’s Ice Cream, was so smooth and seemed designed to put us into a good mood. But, after those brilliant tapas, we were happily already in that zone! All in all then, honest food, flawlessly cooked, just perfect. And obviously widely appreciated as the Greenroom was more or less full. Sage itself was also full. It has gained some extra seating and a different entrance (via the courtyard) after the recent building works that gave us the Greenroom. And the local producers are lauded here in Sage and not just on the tables. On one of the walls there is an excellent photo display of the producers going about their daily work. Well done to Kevin and Réidín for their dedication to their local suppliers! While it is full steam ahead for Sage, the recently opened Greenroom too has been finding itself quite busy in these early days. It opens at nine and, during the morning, you can pop in for a freshly ground coffee and a freshly baked treat. At lunch time, you’ll have great choices of Salads and Sandwiches and, in the evening, the tapas come into their own. The new Greenroom, they call it Sage’s little sister, is also proving useful for a pre-meal drink for those booked into Sage or maybe waiting for a table. And, when the sun shines, the courtyard outside is abuzz. Opening hours: Tue - Sun: 9:00 am - 11:00 pm. Address: 8 Main St, Midleton, Co. Cork. This Miner's Red, all the way from Donegal, is one of the best red ale's I've come across. Recommended. Available in Bradley's, North Main Street (€2.99). 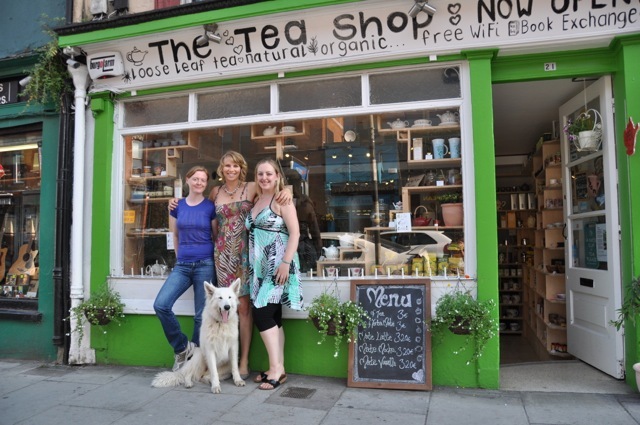 Left to right: Tricia Kehoe, Sonia Birrer and Louise Devoy, with Calinka "The Tea Shop dog"
Banish Rainy Day Blues with Yerba Mate! If you’re looking for something to kick start your day, or even something that will get you through the afternoon without keeping you up all night, The Tea Shop on MacCurtain Street has just the answer as it prepares to introduce Guayaki Organic and Fair Trade Yerba Mate to Cork City this summer. A favourite for centuries with the indigenous tribes of South America and known as ‘nature’s most balanced stimulant’, Yerba Mate is high in anti-oxidants and has been consumed to enhance vitality, clarity, and general well-being. This herbal tea is a product of the Californian based company Guayaki, the world's first Fair Trade Yerba Mate supplier and renowned for its environmentally sustainable projects worldwide. With words such as treaceability, sustainability and labelling hot on the lips of food consumers, Meath Producers have decided to open their doors in a novel way to demonstrate how supporting local is best. There will be two such Food Safari's taking place in Meath on August 4th and 5th. The 'Bia Bus' will be loaded on August fourth with enthusiastic foodies around South Meath, starting in the gourmet village of Slane and visiting Producers such as Burkes Farm Ice Cream, Boyne Valley Blue Goats Cheese, The Whole Hogg Pork Producers, Keoghs Premium Vegetable Farm, there will be quirky stops along the way and it will accumulate in a Producers BBQ at the renowned Boyles Pub in Slane for some apres Safari fun. The next day sees the Bia Bus follow the same format taking to the producers of North Meath including the Award Winning Kilbeg Dairies, Ryan Farm, Kerrigans Mushrooms and Hogans Turkey Farm. Again, there will be stops along the way and the day will accumulate in a producers BBQ in Jacks Porterhouse in Kells. Join us for our fourth series of wine tastings in August and September. Each week a guest speaker will present a selection of wines from the given region and we'll serve up a supper dish to match. All wine tastings take place at ely bar & brasserie and start at 7pm sharp. Beginning with "Alternative Australia" on August 8th (Thursday) at ely bar & brasserie, IFSC. Due to to popular demand, Glenisk is delighted to announce its Dublin based UPFRONT AND PERSONAL pop-up store is set to remain open until the end of August at the corner of Dawson Street and Duke Street. Read more here. Real Olive Company now selling West Cork Garlic on their stall at most West Cork markets. Drinking the World Beer Champions! I was short a few beers for a barbecue last week, so called down to my local O’Donovan’s Off Licence. Was picking out a few of my usual until manager Steve guided me in the direction of his Weihenstephaner display. I knew the name of course, knew that it was a good one, so I said I’ll have one of each please. A very good decision as it turned out. Didn’t know it at the time but it just so happened that I had a bunch of World and European Beer Award winners in my bag. Talking about the 2012 awards here as the 2013 beers are still being judged with the results expected in September. The Weihenstephan brewery, the oldest in the world by the way, was officially founded in 1040. Practice, it seems, make perfect! 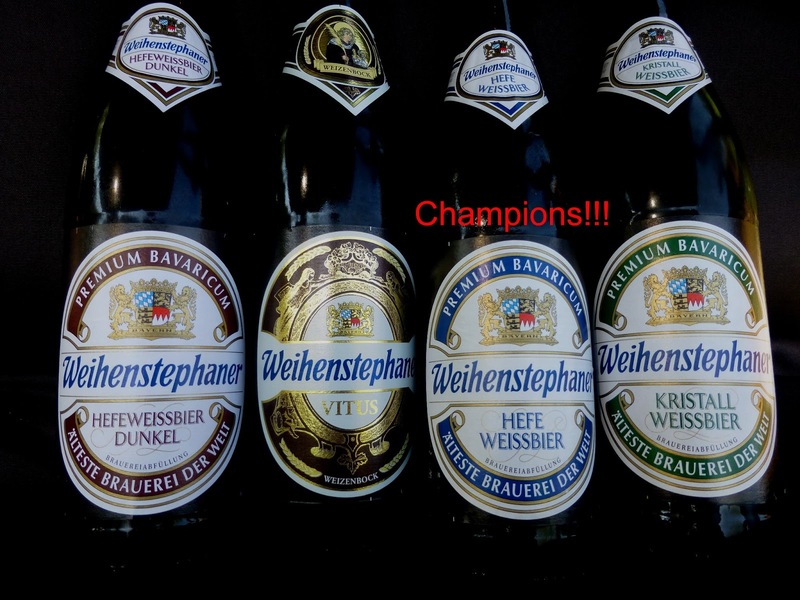 The Weihenstephaner Vitus was the strongest of my selection and that has a couple of titles to its credit. It is the World’s Best Wheat Beer and also the World’s Best Strong Wheat Beer. Citation: Gentle spicy aroma with sweet fruits and vineous notes. Full, rich and tasty. Smooth citrus flavour. Subtle hop and honeyed notes, bubblegum and coriander. 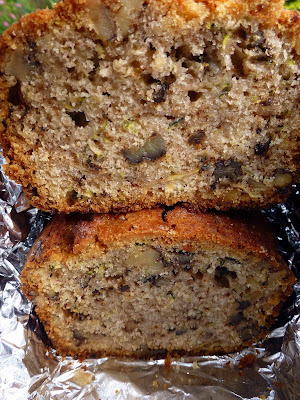 Cloves, spiced apple and sweet grain. Good warming alcohol, surprising balance for its strength (7.7%), smooth yet potent. Good, lingering finish. The Weihenstephaner Kristal Weissbier was voted the World’s Best Bavarian Kristal 2012. Quite a thirst quencher, it has a 5.4% abv. If you haven’t tried wheat beer, this is a good one to start with. Citation: Clean, clove aroma. Very bubblegummy. Warming alcohol, round fruity notes and citrus. Spiced apple and clove on the palate, good full mouthfeel. Complex long finish. The cloudy Weihenstephaner Hefeweissbier is one of my favourite types of beer. This has an abv of 5.4% and was voted Europe's Best Bavarian Hefeweiss. Citation: Phenols and cloves on a lavish aroma. Big palate, firm and well balanced. Sweet banana, spice, caramel and bubblegum. Crisp and clean, good clove and spiced notes. Refreshing and spicy finish. Interestingly, the World’s World's Best Bavarian Hefeweiss came from Japan, the Fujikanko Heights Beer Fujizakura Weizen. Weihenstephaner Hefeweissbier Dunkel also brought home world gold, coming out on top in the World's Best Dark Wheat Beer category. You are heading in the direction of stout with this one! Citation: Woody aroma, with toffee and dark brown sugar. Sweet and slightly sour, good balance. Gentle smooth body, good bready notes. Chocolatey, nutty and creamy. Light toffee on a fruity dry finish. They call this “Yummy” in Karwig’s and it is easy to see why. This very dark red has gorgeous aromas of dark fruit (plum, cherry). On the palate it is smooth and fruity, tannins present but close to unobtrusive. This full flavoured lively wine is a delight and a very good example as to why Montepulciano is so popular. Grape is 100 per cent Montepulciano, 10 days in skin contact, 10 months in barriques, 6 months in large vats, and 6 months in bottle. Takes a bit of rearing! Worth it though as this is a multi-award winner including silver at Decanter World Wine Awards 2012. Very Highly Recommended. Made a mistake when picking up this one – meant to get a Pouilly Fumé. If all errors turned out so well! This, from Burgundy rather than my intended target the Loire, has a pleasant concentrated bouquet and a colour of light gold with shades of green. This Chardonnay has lively intense white fruits yet a fine acidity, well balanced and with a long finish. Quite a refined wine really and Very Highly Recommended. 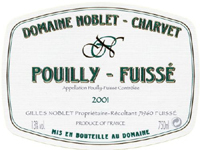 The wines of Pouilly Fuissé “are undoubtedly some of the most famous white Burgundies” and the Noblet family is a long standing top producer while Chardonnay is the most popular and most versatile white grape in the world. The warm weather draws us to the seaside and Wednesday was no exception. 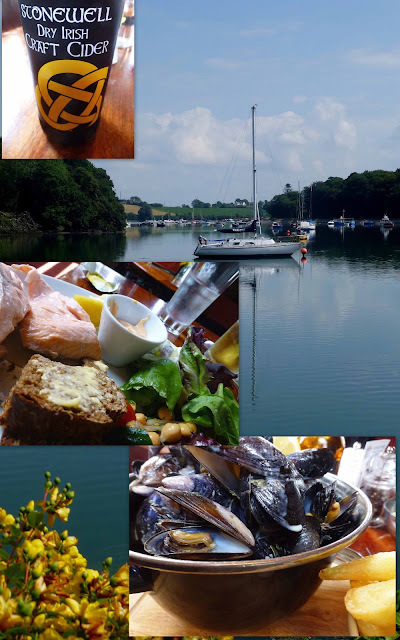 Enjoyed a short walk along the waters leading to Crosshaven and that soon led to a lovely lunch at Cronin’s Pub in the village. Didn’t expect so much choice here. Soups and Pate were available. Could have had a lamb burger or the vegetarian dish of the day. 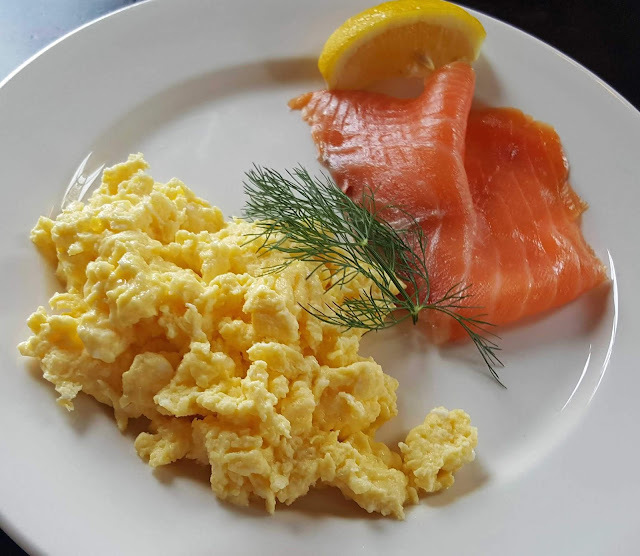 Lots of fish choices including oysters, squid, fish and chips, salmon, mussels (regular or large serving) as well as Fish Plates and Meat Platters. Great to see local craft beers taking their place on the counter of the popular bar and no shortage of bottles in the fridge. With the day being so hot, I sipped from a bottle of that delicious Stonewell Dry Cider, made locally in Nohoval as I studied the menu. Rope reared Oysterhaven mussels, large portion please, was the order. No sign of the rope but the mussels were plentiful, and certainly very tasty indeed. 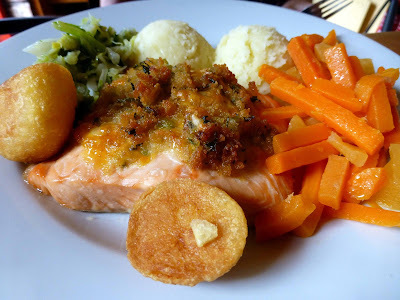 CL was very impressed with her Fresh organic Irish salmon, poached in white wine, served with garden leaves, homemade salads and brown soda bread. The salmon was gorgeous, really well cooked and the leaves and salads were also high class, all for twelve euro. Tempted by the desserts but had to pass a menu that included Banoffee Pie, Knickerbocker Glory, and Apple Pie (Dutch style). As you can see, and as you’d expect given the location, fish is a big part of the lunch menu and that theme continues into the evening, including the cleverly named Seagull Menu (Early Bird to you landlubbers!). The full dinner menu, available Thu-Sat evenings, starts with their Mad fish soup Not your typical fish chowder! Pan seared scallops (GF) make na appearance here. And there are a couple of specialities including Mad Fish Dish, a tomato based Mediterranean fish stew filled with delicious fresh fish and everything that the boats have brought in from mussels to monkfish. Topped with a Galway Bay whole prawn and crispy potatoes. Then you have the Shellfish platter to share, locally sourced shellfish, depending on availability. Served with salad, home baked soda bread and chips. Meat eaters are well catered for with tempting dishes including Spiced beef carpaccio Spring lamb ribs, and Sirloin steak. In addition, if fish or meat isn’t your thing, Homemade Ravioli (Please ask your server for current filling) and the Vegetarian dish of the day are available. All in all, quite a choice. And you’ll be well taken care of. Service at this week’s lunch wasn't the least bit fussy, with time for a crack and a chat, and still very efficient. Eamon O’Neill, Crab and lobster, Kinsale. Dermot Cunningham, The Fisherman, Crosshaven. Good Fish Shop, Carrigaline, Co. Cork. Haven Shellfish, Oysterhaven, Co. Cork. Shellfish de la Mer, Castletownbere, Co. Cork. Sally Barnes Woodcock Smokery, Castletownshend. Tom Durcan’s Butchers, English Market, Cork. Mags Curtin, Milis, Crosshaven. Co. Cork. in her book Through My Kitchen Window. 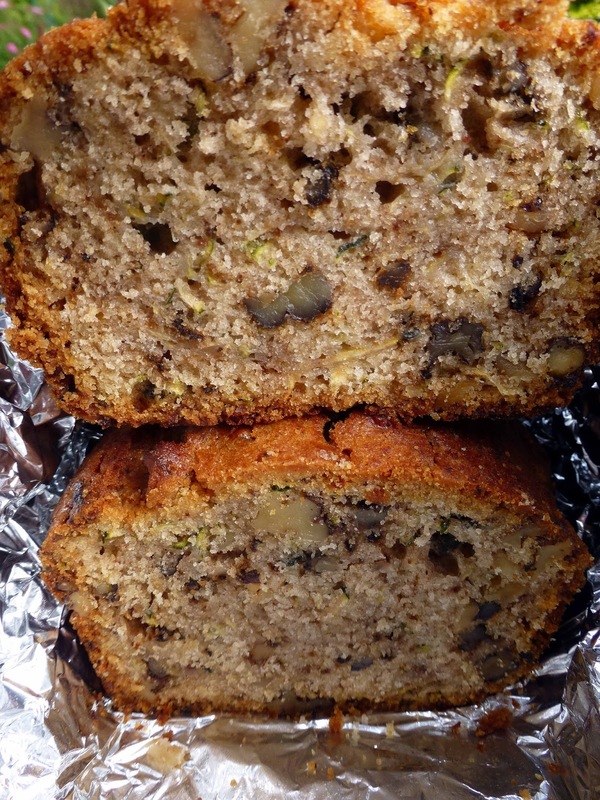 "Breaking the Mould of Irish Baking" in the 90s. but is especially appreciated here at breakfast. last year; they may still have copies. We welcome tours of all kinds to our beautiful 65 acre organic farm! We are available for school tours for both national and secondary students, university and college students and holiday and vacation trips for all ages. Our tour takes approx 1 hour and includes a full tour of our working organic farm. There is a chance to pet our beautiful goats, see them during feeding time and get a better understanding of organic farming. A cheese making demonstration is included and also a tasting of our gourmet cheeses. 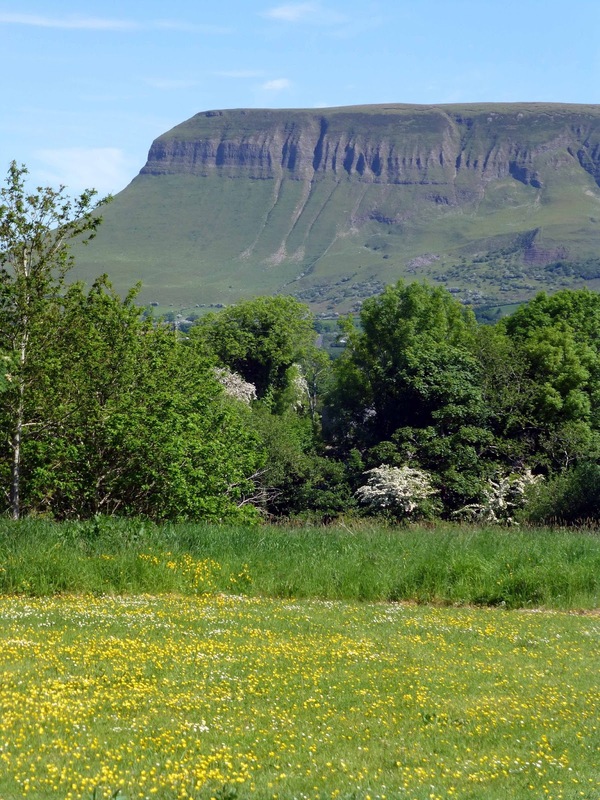 Our farm is just south of the Burren and only half an hour from the Cliffs of Moher - it can easily be incorporated into a full days touring. Avonmore Sponsors Neven Maguire Demos. One of Ireland's best known and loved celebrity TV chefs, Neven Maguire, has launched a series of cookery demos in association with Avonmore and will be held throughout Ireland... Click Here. Includes Salmon and Asparagus recipe! Fresh and local is the policy at Bull McCabe’s on the Airport Road. 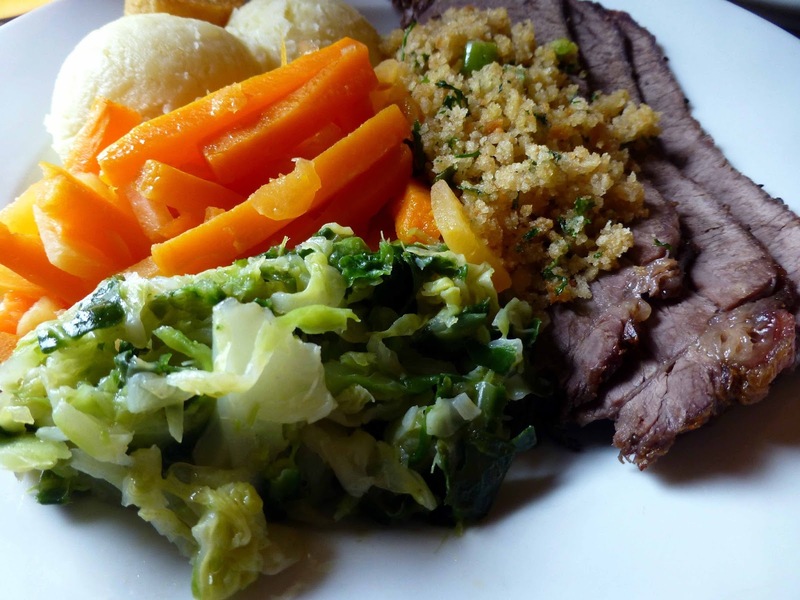 Meat comes from Ballyburden Meats in Ballincollig, relishes from Christie’s Celtic Kitchen in Carrigaline and fruit and vegetables from Waterfall Farms. And there is also a good choice of local drinks available. 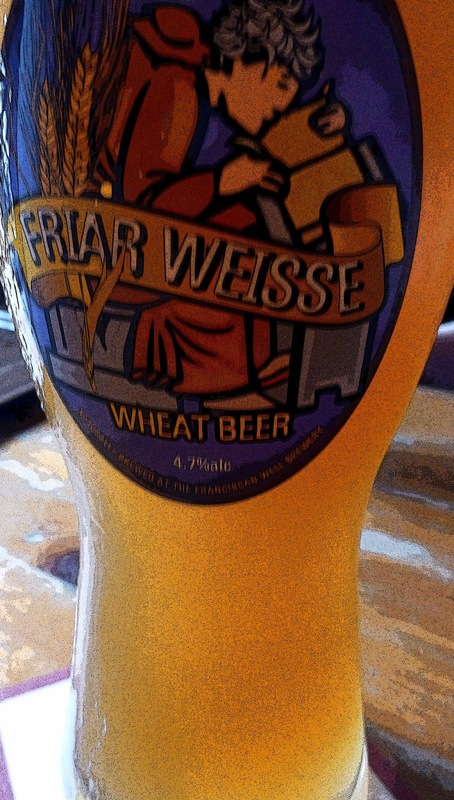 At lunch yesterday, I downed a cool pint of Friar Weisse from the Franciscan Well. Other choices available include Howling Gale Ale from Eight Degrees and Cider from Stonewell in Nohoval. And they have a different guest beer every month. Let me just stick to the drink for a minute. Their whiskey comes from Midleton Distillery and Bull McCabe’s is a venue where you may enjoy a Jameson Reserve Tasting. It costs just €12.50 to do the tasting which includes a Whiskey Appreciation Guide and 25 mls each of Jameson Select Reserve and Jameson Special Reserve 12 year Old and, wait for it, 25mls of Jameson Gold Reserve. 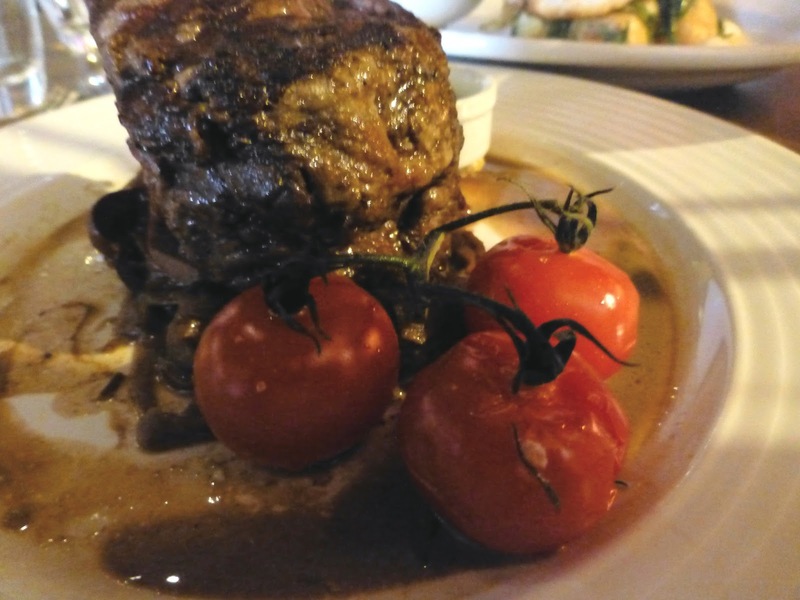 The tasting is a feature of the regular Tuesday Ruaile Buaile Nights at the Bull where you have a three course meal, the tasting and entertainment for a grand total of €32.50. Sounds like fun. The carvery lunch there is very good, lots of meat dishes and salads available, also sandwiches and wraps. A bit too hot for the soup so I went direct to the Roast Beef with all the trimmings (€12.90) while CL picked the Baked Salmon (11.70). Two faultless plates, very enjoyable, especially the cooked to perfection vegetables (carrots and cabbage). No shortage of homemade desserts available including Strawberry Roulade, Coffee and Walnut, and Apple Pie. My choice (two spoons, though) was the gorgeous Pear and Almond. They also do a Tuesday lunchtime tenner special and yesterday’s offers, again with all the trimmings, were Roast Stuffed Turkey and Homemade Lasagne. Owner Derek told me that their Evening Special (two courses for €17.50) is proving very popular. Here, you may have a main course with a starter or a main course with dessert. Other big draws on the evening menu are the Burger, the Chicken Fajita and the Chicken Curry. The Blackboard Specials are available Monday to Friday 5.00 to 9.00pm. Dinner is also served on Saturday, same times. It is a busy spot. And a lively one. Lots of fun and events there. Not so long ago they had their Iron Man contest, one with a difference as the object was to find a guy who could best handle a clothes iron! Watch out for their Food and Beer Matching event, coming up, most likely in September. Being close to the airport and to a few hotels in the area, Bull McCabe’s gets quite a lot of foreign visitors. Derek tells me that Irish beef is very highly regarded by them. He wasn't surprised at that but was slightly surprised to hear a group of Austrians declare that the Franciscan Well’s Friar Weisse was the best beer they had come across! 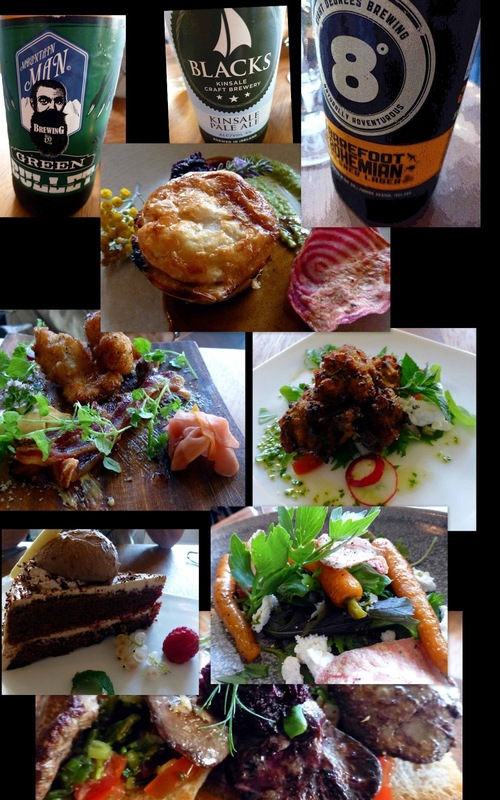 Great to see a bar/restaurant that supports local producers doing well. Long may it continue? Superb Vin for your Table! Dômaine Aonghusa Mazuelo 63+, 2011, Vin de France, 14%, €15.30 Karwig Wines. 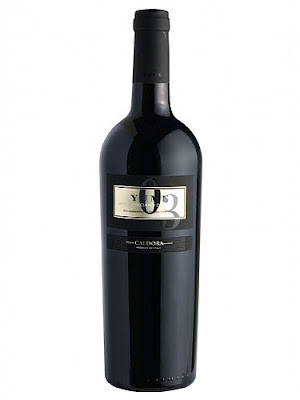 Irish winemaker Pat Neville made this dark red aromatic wine in his hilly Languedoc vineyard. The word Mazuelo is sometimes used for Carignan in Spain and the 63+ apparently refers to the youngest Carignan vines that were part of the blend. Unorthodox or not, this is a gorgeous fruity wine, a superb lip smacking red, well balanced and with a good dry finish. Vin de France is a designation that has been used since 2010, partly to replace the Vin de Table. But it is a lucky table that has one of these Aonghusa bottles on it. Very Highly Recommended. 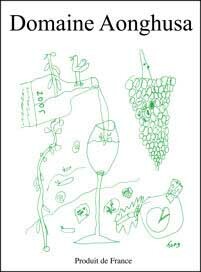 You may read some of Neville's winemaking philosophy - he does have some wines with Corbieres AOC designation - on his website or wait until the Autumn (September 5th) when Karwig Wines will have Pat and his wines at a dinner in Fresco Bistro as part of the WineGeeese Series. Cave d`Irouleguy, Mignaberry 2010, 13.5℅. From the western edge of the Pyrenees to the eastern and to what is the smallest French AOC, that of the Basque area called Irouleguy. They use the Tannat grape a lot in their red (and rose) wines, good for the heart but with a reputation of being tough on the palate. But I reckon the local winemakers have it spot-on here in this award winning red. Harvested by hand and raised in barriques, this wine, purple coloured by the time you pour, is delicious and generous, with good fruit concentration and crisp acidity. My only problem was that I drank it too soon, should have kept it for a few years. Looks as if I'll have to return to the Pays Basque. 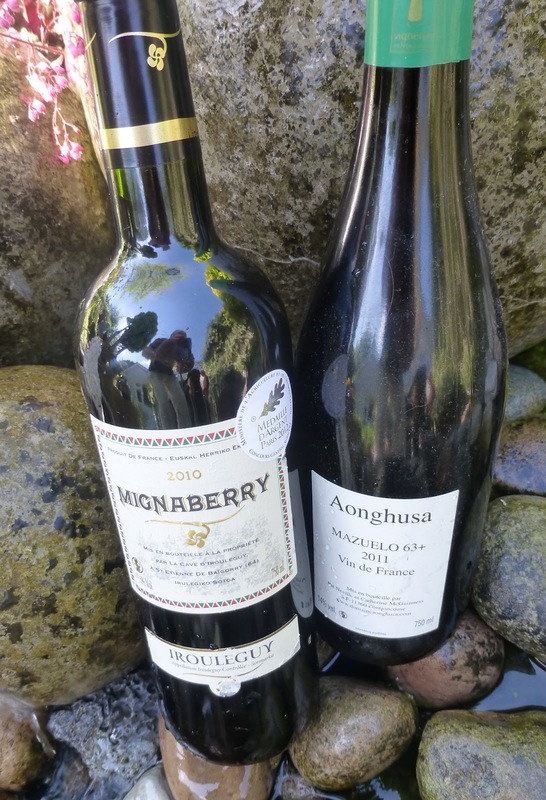 Meanwhile, if you are in south west France on hols or at a rugby game, didn’t hesitate to treat yourself to a bottle of Mignaberry and see if you handle the Tannat! Never heard tell of the Adare Old Creamery store until a recent visit. Now feel like I should tell you all about it. 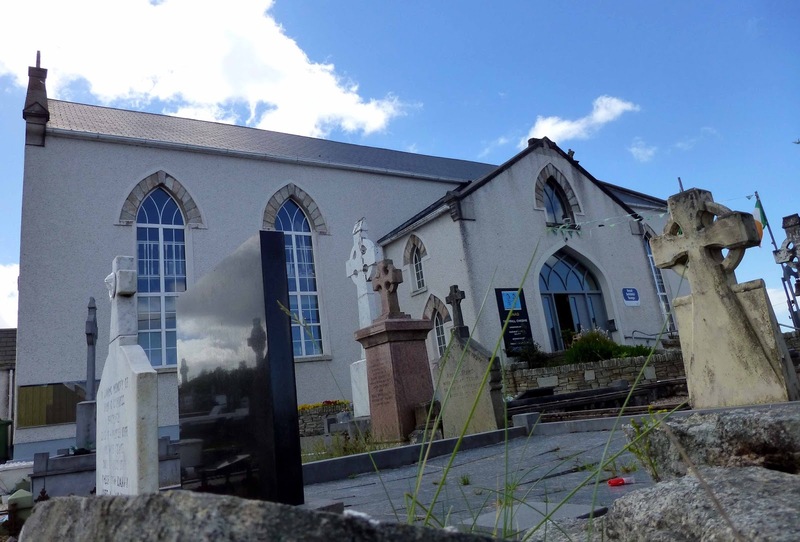 It is just a few hundred yards from the County Limerick village and it quite fascinating. Maybe you want to buy a doll’s house or furniture for it. Some beautiful scented candles perhaps. Maybe high quality china such as Aynsley or Belleek. Well, this is the place to check out – see it on Facebook. Downstairs there is an old style sweet shop (including ice-cream) and upstairs a gorgeous tea-rooms (with the best apple pie ever!). Fun animations all over the store. Books and clothes and much much more in this treasure house. And later in the year it turns into an incredible Christmas store. A must visit. 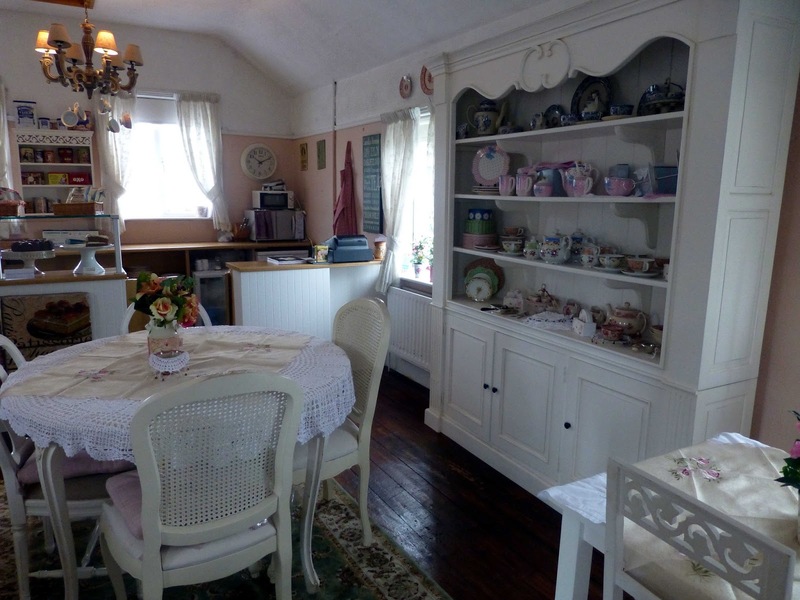 Three Tea Rooms: one in a church, one in a churchyard and one in a "big house" kitchen. “Under bare Ben Bulben’s head” sits Drumcliffe church and the churchyard where poet William Butler Yeats is buried. “Horseman pass by” is the last line of the famous epitaph. Today’s horseman though is more likely to sup at the Drumcliffe Tea House, also in the church grounds, before turning the key in the ignition. Here, just outside Sligo on the road to Donegal, they serve good teas and coffees (Bewley’s), “mouth-watering cakes and desserts” and good “wholesome food”, including soups and tarts. There are Yeats and Irish interest books to browse through and a selection of good quality original souvenirs. Plenty of parking for the churchyard and there are well kept toilets in the tea rooms. Another famous Irishman, happily still with us, Daniel O’Donnell, famously used to serve tea to the world and mainly to the world’s wife. 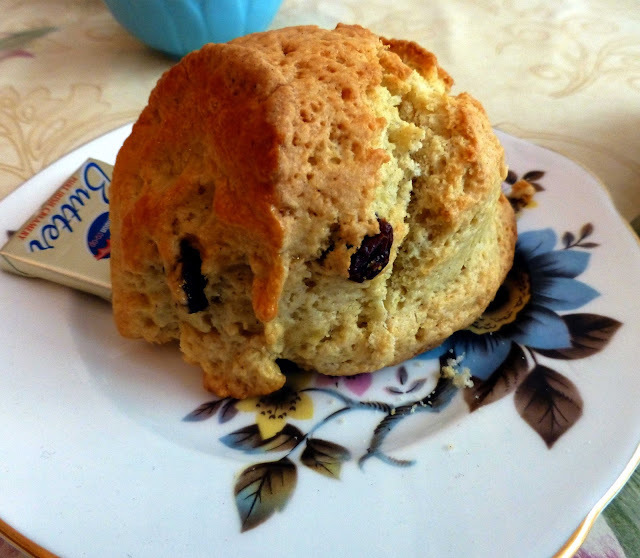 That function has now been taken over by the unusual Scrummylicious Bakery and Tearoom in Dungloe, County Donegal. You’ll find this friendly place in the old chapel at the top of the main street. Not alone does the cafe offer teas and coffees (Robert Roberts) but they also have a full bakery service. The products can be taken home to enjoy or enjoyed in the unique tearoom within the old church building. “Our tearoom has a select menu of gourmet sandwiches, wraps, bagels, light meals and delicious homemade soups”. The converted building also hosts the tourist office, the library and other local services, and, yes, toilets! 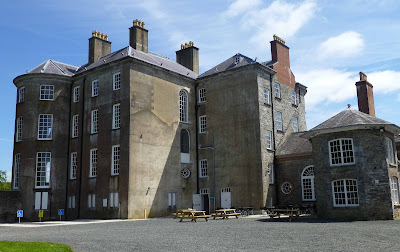 Doneraile, with outside eating area. Tea Rooms in the old kitchen, open daily, and a Farmer’s Market are among the recent attractions added to Doneraile Court in North Cork. The old pile itself, just off the main street in Doneraile, is surrounded by hundreds of acres of parkland where you have a great selection of walks. Called in there the other day for a sandwich. This was filled with real ham, cut from the bone, and was a bargain at four euro. A toasted sandwich, packed with chicken and served with a salad, came to €4.50. But there is quite a menu here. Soups, sandwiches and curries and also breakfast dishes and a specials board for during the day. You can even order some items to take away. Lots of picnic tables scattered around the park also. Four Tea Rooms: Town, city, coast, mountain. Lovely scone and gorgeous plate at the Duchess. Never really associated myself with tea rooms but I’ve been in at least four over the past few months. Began with a call to the lovely Tea and Garden Rooms in Ballyvaughan (Co. Clare); next up was the Phoenix Park Tea Rooms; up the Kerry hills next to the Pancake Cottage before the most recent call to the Duchess Tea Rooms in Bandon. It was a bitterly cold morning in Bandon and after a visit to the local Farmers Market a hot cup was required. Just happened to be passing the Duchess Team Rooms and popped in. Nice bit of heat there and three or four welcoming sofas, just like home. 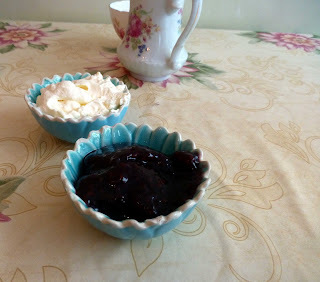 Sat myself down and soon I was tucking into a really well made fruit scone with no shortage of cream or jam. Coffee was excellent but next time, I must try the tea as they have a massive selection. There is great degree of comfort here, lots of calming colours all around and perhaps the ideal place for afternoon tea with a wide assortment of finger sandwiches, scrumptious mouth-watering delicate pastries, little cakes and scones to choose from. It is the best part of two years since I indulged in the full afternoon tea. Wonder if the Fota Island Resort Hotel are still doing it. Just like the Duchess Rooms, you may enjoy a little lunch or a light meal in all the tea rooms. Had a great Fish Pie in the well situated Tea and Garden Rooms in beautiful Ballyvaughan. This is a lovely spot, right alongside Galway Bay, and with gardens front and rear. But if you go here, you will not be able to avoid the sweet cakes. As you go in, you’ll see them in all their tempting colours, the table groaning underneath. The Phoenix Park Tea Rooms, just across from the entrance to the Dublin Zoo, looked splendid under the Autumn colours of the many nearby trees and, as we ate, the squirrels were hopping around outside. They are open all day long and include some terrific organic stuff on the menu, including the coffee and tea. All the vegetables, salads and fruits are from Kinneden Organics in Roscommon, the chicken is from Cootehill in Monaghan. And their sourdough is by Arun Bakery. On the road from Sneem (Co. Kerry) to Moll’s Gap, there is a place called A Strawberry Field where you will find Pancake Cottage, which is open all year round. The views from the garden are splendid, weather permitting! 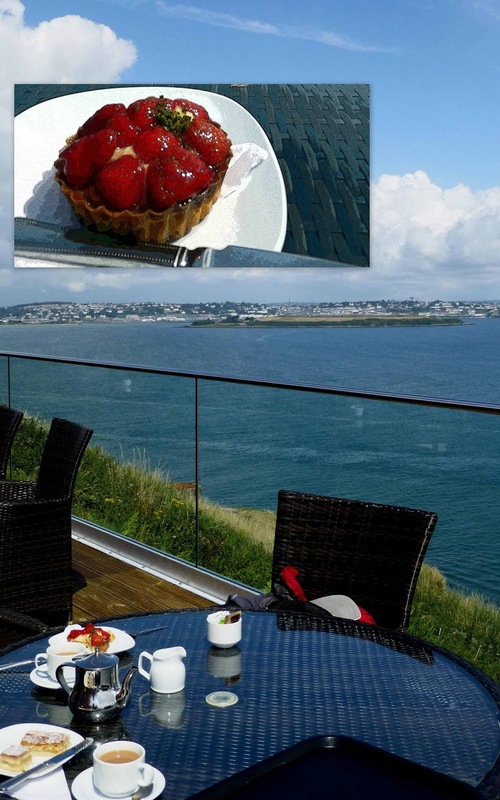 While you may enjoy a cuppa here, maybe with a Dutch Apple Pie, their speciality is the pancake. The selection of pancake toppings just goes on and on, sweet and savoury, and also a kids menu. Another tea room well worth a call, just like the other three. Al Fresco at Cobh's Titanic Bar & Grill. Mustard Seed. An oasis in Limerick. 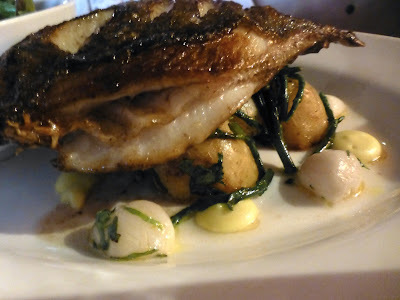 Wanted: Ireland's Best Fish Dish!